Thanks to a very generous gift from a friend, I was introduced to the art of Robert Wu of Marbled Graphics™ . I have Robert’s graphics in every room of my apartment. I won’t be posting pictures of my apartment, though. It’s a slippery slope. First, my apartment, and next thing you know, I’ll be posting pictures of my cats. There are more than enough pictures of cats on the internet. You can see some of Robert’s marbled paper art here and purchase it here. Very shortly after receiving this wonderful gift, I discovered that Robert is also an accomplished bookbinder. 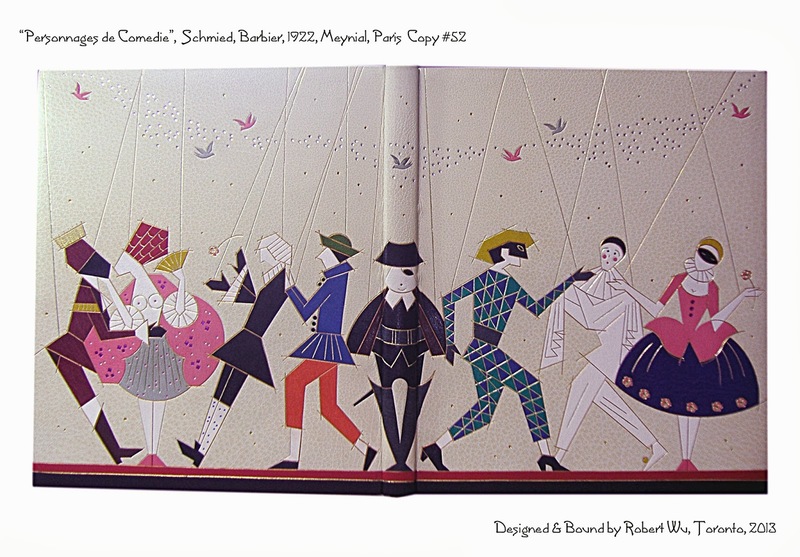 Since the founding of Designer Bookbinders of America (2011), of which Robert is a member, I’ve been following his career with great interest. 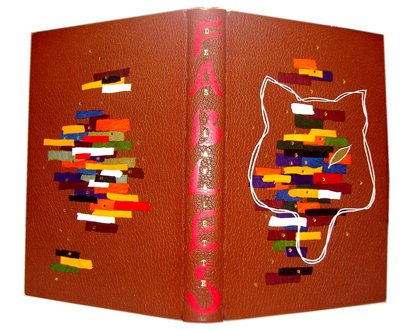 Robert’s most recent achievement is a commission by the Thomas Fisher Rare Book Library, University of Toronto, for a binding of George Barbier and Francois Louis Schmied’s Personnages de Comedie (Paris, 1922). It is currently on display in the Fisher Library’s exhibit: “Chevalier du Bracelet” George Barbier and His illustrated Works. Another Robert Wu binding, on loan from the Royal Ontario Museum, is also featured in the exhibit. Check out this guided tour of the exhibit, narrated by the curator, Arthur Smith. Please do not be under the misapprehension that appreciation of Robert’s binding is limited to Ontario. 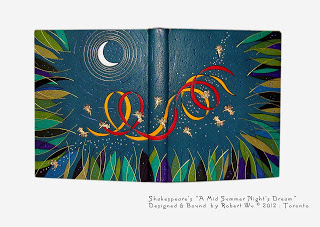 Robert has twice earned the great honor of his bindings being selected for the traveling exhibits of the triennial Designer Bookbinders International Competition. Robert also has many private commissions which, of course, do not get published on his website. One of Robert’s specialties is miniatures. I hope Robert will forgive me for not writing much about this aspect of his work. I have written enough about minis for the moment. 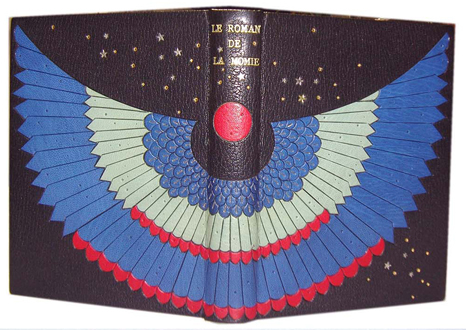 However, it is necessary to mention Robert’s love of all things tiny and made of paper, in order to understand why and how Robert became a designer bookbinder. I discovered bookbinding initially through ORIGAMI! I have always been interested in paper folding and one day (back in high school), I discovered at a bookstore a diagram of folding a sheet of paper into a multi-page miniature book. I was intrigued and it fascinated me. Then I realized that I couldn’t write much in it, so I went back to the bookstore and found a manual on bookbinding basics. At that time, the basic bookbinding manual looked very complicated to me, but I decided to give it a try. So I started making my first properly bound books in miniature format when I was in high school, and I was hooked. I think within a few years of making my miniature books, I discovered the Canadian Bookbinders and Book Artists Guild (CBBAG) in Toronto. I started taking workshops in bookbinding because I wanted to make better miniature books. We are really fortunate here in Toronto to have CBBAG, as it offers a really solid foundation for bookbinding and book arts. During my early university years, I was taking many different workshops at CBBAG. One of the instructors introduced us to a bookbinding manual in CBBAG library called My World of Bibliophile Binding written by Tini Miura. 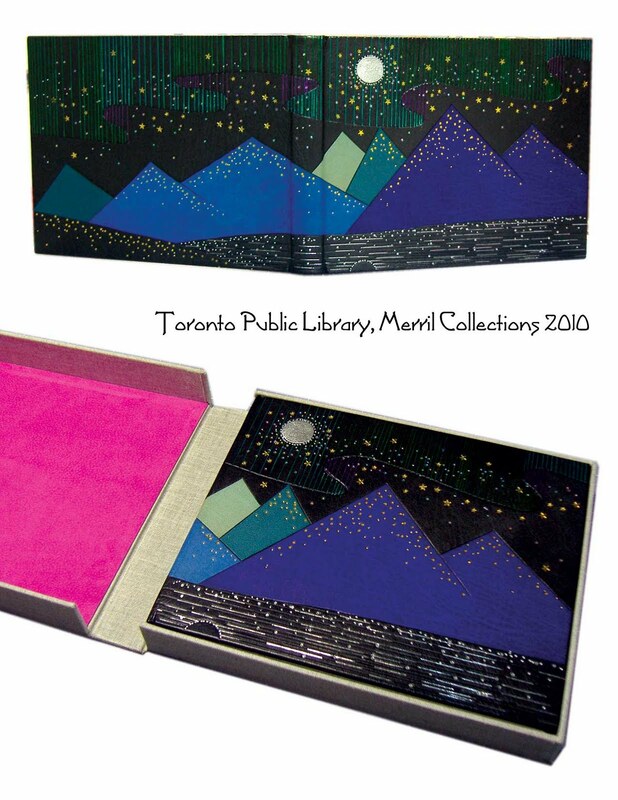 I think it was through Tini’s works and writing in the book that I was first introduced to the concept of design binding: bookbinding as art. 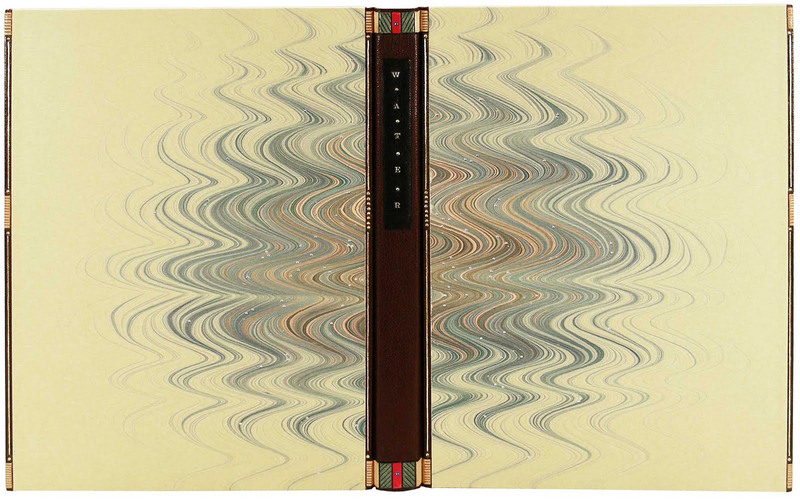 Then, I discovered another book called Art Nouveau and Art Deco Bookbinding by Alastair Duncan. It was this book that sealed my fate as a designer bookbinder, and I decided to get advanced training in bookbinding so I could do exactly what I saw in the books. Robert has much more to say about his training, inspiration, and challenges as a binder, but this post is long enough. Part two coming soon.